Stan Coren's groundbreaking The Intelligence of Dogs meets Bernd Heinrich's classic Mind of the Raven in this astonishing, thrilling look at the uncanny intelligence and emotions of crows. New research indicates that crows are among the brightest animals in the world. And professor of Wildlife Science at the University of Washington John Marzluff has done some of the most extraordinary research on crows, which has been featured in The New York Times, National Geographic, and the Chicago Tribune, as well as on NPR and PBS. Now he teams up with artist and fellow naturalist Tony Angell to offer an in-depth look at these incredible creatures—in a book that is brimming with surprises. Redefining the notion of "bird brain," crows and ravens are often called feathered apes because of their clever tool-making and their ability to respond to environmental challenges, including those posed by humans. Indeed, their long lives, social habits, and large complex brains allow them to observe and learn from us and our social gatherings. Their marvelous brains allow crows to think, plan, and reconsider their actions. In these and other enthralling revelations, Marzluff and Angell portray creatures that are nothing short of amazing: they play, bestow gifts on people who help or feed them, use cars as nutcrackers, seek revenge on animals that harass them, are tricksters that lure birds to their deaths, and dream. The authors marvel at crows' behavior that we humans would find strangely familiar, from delinquency and risk taking to passion and frolic. A testament to years of painstaking research, this riveting work is a thrilling look at one of nature's most wondrous creatures. 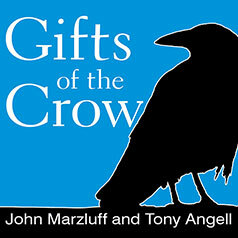 You can’t view any supplemental PDF materials before you buy Gifts of the Crow. If you purchased it elsewhere, please enter the access code provided in the beginning of the audio to view the supplemental material. All access codes should be entered in lowercase letters. PDF software is required to view the supplemental PDF.